We're delighted to share with you some of our very favorite ways to incorporate healthy pistachios into your party spreads. Their earthy, nutty flavors (and crunch!) 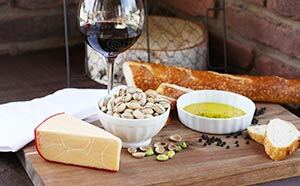 will complement any cheese/charcuterie board, appetizer platter, or beverage selection. Need to impress dinner guests with an appetizer that is sure to please? Pair these savory flavors together: Sour dough baguette, extra virgin olive oil with cracked pepper, salted pistachios, aged Gouda cheese, and Zinfandel. Your guests will enjoy the pairing of these flavors. 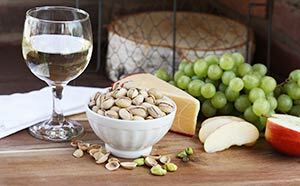 The nutty rich flavor of aged Gouda paired with the salty pistachios, crisp gala apples, grapes, and Pinot Grigio makes your mouth sing with flavor, texture, and deliciousness! These savory flavors complement each other and would be served well as a dinner appetizer or a fun summertime snack. The best way of all is to simply crack open the shells and pop the pistachio nut right in your mouth! Pair this with any beverage and have an empty bowl handy to catch all the shells in. Check back often - we'll be adding new pairings soon. 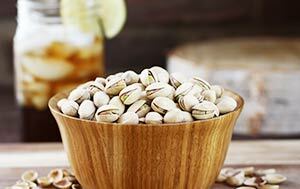 In the meantime, stock up on your favorite pistachios for your next gathering of friends and loved ones.